If you are an occasional traveler looking to rack up some miles to use toward your next trip – but can’t justify paying the high annual fee that comes with many travel cards – the VentureOne from Capital One can be a great choice. The card offers a good flat rate of miles on all purchases, plus a generous bonus on hotels booked and paid through Hotels.com/venture. Even better, the VentureOne card also includes a relatively low APR and gives cardholders a 0 percent intro APR on new purchases for the first 12 months (14.24 to 24.24 percent variable thereafter). If you have a bigger trip to finance and want some time to pay it down before you accrue interest, this is a huge perk. New VentureOne cardholders who spend at least $1,000 in the first three months can earn 20,00 miles – worth up to $200 in travel purchases. For a card with no annual fee, this is a pretty generous offer. Earning miles with the VentureOne card is very straightforward. Cardholders earn 1.25 miles per dollar on every purchase they make – unlike many travel cards which only offer more than 1 point per dollar on certain categories. Plus, VentureOne users can earn a generous 10 miles per dollar on hotels booked and paid through Hotels.com/venture. There is no cap on this offer, meaning that longer, pricier stays can bring in a lot of miles. If you don’t stay in hotels very often, however, the earning rate on the VentureOne card might not be the best for you. Many cash back cards offer 1.5 percent cash back on every purchase, which you could then use to book travel. Even some flat rate travel cards – like the Discover it Miles – offer 1.5 miles per dollar on all purchases. If you opt for a travel credit card with bonus points or miles in a few categories, you might be able to earn more than 1.25 miles per dollar by weighing your spending toward those categories. What are VentureOne miles worth? When you redeem miles earned on your VentureOne card for travel purchases, they are worth 1 cent per mile. This is another drawback to the card, as many travel credit cards offer higher point values when redeemed through the bank’s travel portal. For example, points earned on the Chase Sapphire Preferred Card are worth 25 percent more when redeemed for travel through Ultimate Rewards, for an average value of 1.25 cents per point. See Related: How much are Capital One miles worth? When you combine a limited mile value with the fact that the earning rate on the VentureOne falls below some flat rate cards, it limits the VentureOne’s appeal. Especially for users who won’t use the Hotels.com bonus category to boost their rate, choosing a travel card that offers a higher flat rate on all purchases or springing for a card with better bonus categories and an annual fee might be a better option. On the plus side, the VentureOne card has one of the most flexible redemption setups among travel cards. You can redeem miles for any travel purchase, whether it was booked through the Capital One Travel Center or an outside site. With the Purchase Eraser, you just select “Redeem a purchase” on your online account or mobile app to view any eligible travel purchases from the previous 90 days. Then, you can apply your miles toward a statement credit to cover any amount of that purchase – from as little as 1 mile to the whole cost. Unfortunately, non-travel redemptions don’t eke quite as much value out of your miles. If you opt for a gift card, statement credit or check, miles are worth much less. To ensure you are getting good value out of your miles, stick to travel redemptions. Capital One also recently added 14 travel partners, which VentureOne cardholders can transfer miles to at a 2:1.5 rate. Despite losing some of the value of your miles in the transfer, you actually might be able to get more value in the long run. Since many airline miles are worth more than 1 cent per mile, you can stretch them further by transferring to a frequent flyer program. Unfortunately, this is not the best list of travel partners among credit card issuers, as it does not include a major airline. However, you can still get great value by transferring your miles, especially if you are a frequent flyer of Aeroplan (Air Canada), Etihad, Avianca or Singapore Airlines. See Related: Is it worth it to transfer miles with the Capital One Venture card? The VentureOne card comes with a few additional perks that can save cardholders money while shopping or traveling. No foreign transaction fee – When traveling abroad, you won’t be charged a surcharge on foreign transactions. Travel accident insurance – In the case of accidental death or dismemberment while traveling, you can be insured up to $250,000, as long as the entire cost of the passenger fare was paid with your VentureOne card. Car rental insurance – For car rentals booked and paid with the VentureOne, you’ll receive secondary coverage in case of damage or theft. Extended warranty – Double the manufacturer’s warranty up to one additional year on eligible purchases with warranties of three years or less. Virtual card numbers – To protect your card information while shopping online, you can generate a unique virtual card number for each merchant. To make the most of these benefits, you should put all major purchases on the VentureOne card. If you are serious about racking up travel rewards, Capital One also offers a card with an annual fee – the Capital One® Venture® Rewards Credit Card. Compared to the VentureOne, the Venture card comes with a higher earning rate, sign-up bonus and more travel perks, but you’ll have to pay a $95 annual fee (waived first year). By our estimates, even more moderate spenders can get enough extra value out of the Venture card’s higher rewards rate (2 miles per dollar on general purchases) to make up for the annual fee. For example, cardholders who spend at least $12,667 per year on their card ($1,056 per month) can earn enough with the Venture to offset its fee and earn the same rewards as the VentureOne. For spend levels above that threshold, the Venture card outpaces the VentureOne. Plus, it comes with extra perks that add value – such as a statement credit (up to $100) for a Global Entry or TSA PreCheck application every five years. The VentureOne card is designed for users with good to excellent credit (above 670), so you’ll want to ensure you meet those qualifications before you apply. If you are worried about your eligibility and want to avoid a hard pull on your credit, you can take advantage of tools like CardMatch™ to see if you pre-qualify for the card. Among major issuers, Capital One has a decent customer service reputation – but not the best. In J.D. Power’s 2018 customer satisfaction survey, the bank scored 803, ranking fifth out of 11 major issuers. The bank offers 24/7 customer service as well as an online chat feature to answer quick questions, but this service is difficult to locate on the website. The bank’s app does rate well however, rating 4.7 out of 5 on the Google Play Store and 4.6 out of 5 on the Apple App Store. How does the VentureOne card compare to other travel cards? 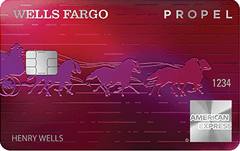 The Wells Fargo Propel card offers bonus points in certain categories of spending rather than a flat rate, but savvy spenders can boost their rewards rate by weighing spending toward those categories. Since options include high-budget purchases like dining and gas station purchases, it should be easy to earn plenty of points. Plus, the Propel card comes with a much higher sign-up bonus than the VentureOne. It offers 30,000 points to cardholders who spend $3,000 in the first three months – one of the highest intro offers available for a card with no annual fee. The Discover it Miles card offers a flat rate of miles on every purchase, making it a great option for cardholders who prefer to put all of their spending on one card. Plus, its 1.5-mile-per-dollar rate easily outpaces the VentureOne card’s 1.25 miles per dollar, even when you factor in the Hotels.com bonus. The Discover it Miles card also comes with a unique sign-up bonus that can be very lucrative for heavy spenders. It matches all the miles you earn in the first year, with no cap on how much you can earn. For a cardholder who spends $15,900 a year on purchases, you can earn 47,700 miles in the first year alone. Like the Discover it Miles, the Bank of America Travel Rewards card offers a flat 1.5 points per dollar on all purchases, outpacing the earning rate of the VentureOne. In addition, Bank of America or Merrill Lynch account holders can boost their rewards rate even further. All eligible account holders receive a 10 percent higher rewards rate, and those with a significant balance can enroll in the Preferred Rewards program to earn even more. Depending on your tier in the program, you could earn up to 2.62 points per dollar – an outstanding rate for a card with no annual fee. Who should apply for the VentureOne card? Cardholders looking for a simple travel rewards card with a flat rate of miles. Travelers who prefer booking on third-party sites who want to be able to use rewards. Cardholders who want to earn travel rewards without paying an annual fee. Redeem your miles for travel purchases to get the best value. Consider transferring to a travel partner to boost rewards value. Book and pay for hotel reservations through Hotels.com/venture to take advantage of a generous rate. Is the VentureOne card worth it? The VentureOne card offers some decent travel perks and a good flat rate of miles on general purchases, but it doesn’t have the highest earning rate – even among cards with no annual fee. Unless you spend enough on Hotels.com purchases to boost your rewards rate, you might be better off opting for a higher flat-rate travel card or one with bonus categories you can use to maximize your earning. Additionally, if you spend at least $12,667 a year, the Capital One Venture Rewards credit card can actually earn enough more in rewards to offset its $95 annual fee (waived first year).